Heat oven to 400°F for dark or nonstick pan (425°F for all other pans). Spray 14-inch round pizza pan with cooking spray. Unroll dough; place on pan. Starting at center, press out dough to edge of pan. Bake about 8 minutes or until lightly browned. Meanwhile, in 10-inch skillet, cook bacon 4 to 6 minutes over medium-high heat, stirring frequently, until just crispy. Remove bacon; drain drippings, leaving 1 teaspoon in skillet. In same skillet, add eggs; cook 2 to 3 minutes over medium heat, stirring frequently, until firm but still moist. Spoon and spread eggs over partially baked crust. Drop cream cheese over eggs. Top with Monterey Jack cheese, bell pepper, onion and bacon. Bake 9 to 13 minutes longer or until crust is golden brown and cheese is melted. To serve, cut into 6 wedges. Sprinkle with cilantro; serve with salsa. You can also use Monterey Jack or Cheddar cheese. Don't have a round pizza pan? Press crust into 15 x 10 x 1-inch pan, sprayed with cooking spray. *All breads made with at least 8 grams whole grain. At least 48 grams whole grain recommended daily. This is not a drill. With this breakfast pizza recipe, you no longer have to choose between your favorite meal and time of day. That’s right—pizza for every meal is now possible! It’s no surprise that pizza itself is one of the top meals worldwide. Did you know that Americans consume hundreds of pizza slices are every second? Eat This, Not That! reported a whopping 350 slices of pizza are eaten each second in the U.S. To put that in perspective, approximately 21,000 slices of pizza are consumed every minute. 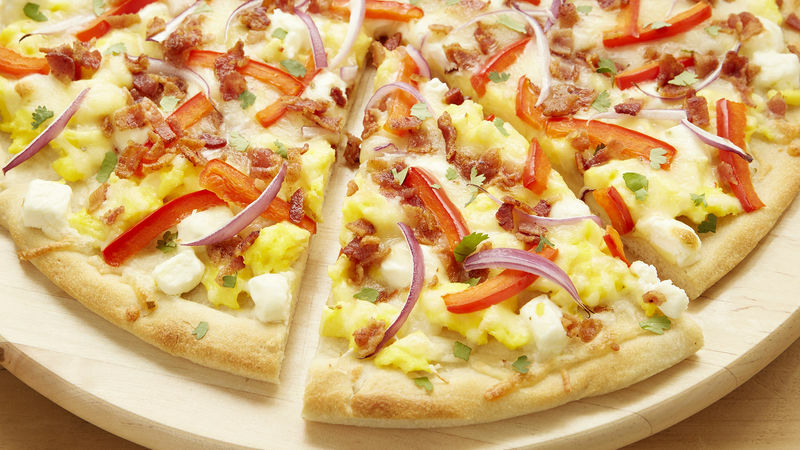 This breakfast pizza preps in just 25 minutes and features a balance of bacon, eggs, cream cheese, bell peppers and Pillsbury classic crust. By combining protein, fat, carbohydrates and fiber, this pizza is a one-stop shop for kicking off your nutritional goals for the day. In fact, each serving of Pillsbury pizza crust contains 5 grams of protein. Feel like changing up your pizza order? Think outside the delivery box with our extreme pizza ideas. Or, try our Sheet-Pan Tater-Topped Breakfast Pizza, next, plus all of our other breakfast pizza options .